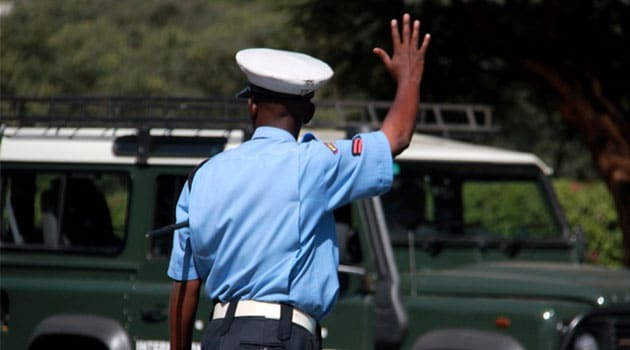 A senior administration police officer based at Nyayo House has been accused of being behind major highway robbery incidents. Senior Superintendent John Murage has most recently been linked to a major robbery where goods were stolen along the Nakuru-Eldoret Highway. According to lawyer Waiganjo Mwangi, Murage was at the time of the robbery in charge of Molo AP Camp. Several witnesses have linked him to the Sh4.9 million theft that happened back in February 2012. Mr Waiganjo says that the officer instructed officers, also charged with the theft of the assorted goods; Francis Karanja, Reuben Kimeli and Caroline Chebet to get the stolen goods. Others also charged with the robbery include; Anne Njeri, Margaret Waithera, Paul Thiong’o, Peter Gitau, Daniel Nyabera and James Gathecha. But according to a retired officer, Joseph Kioko, investigating the case, Murage was in no way involved in the robbery. “I did not see them steal the goods and not even a single statement was recorded indicating someone saw them steal the goods,” Kioko told a court. He further noted that the stolen goods were found in a house believed to belong to Chebet. Another officer, Chief Inspector Charles Bundi said they intercepted a vehicle along the busy Molo-Njoro Road. The driver identified himself as Daniel. Daniel, after being interrogated said the goods belonged to a person only identified as David. “We saw the goods inside the vehicle and asked the driver to take us to David, he lead us to Turi and showed us a home where we met Njeri,” Bundi said. In the house, nothing was found.